the Gamblers giving a gift to the fans, it’s the fans bringing stuffed Teddy Bears to the game. A near capacity crowd at the Resch Center will throw Teddy Bears on the ice when the Gamblers score their first goal. Those Bears will be collected and donated to pediatric patients at local hospitals and other charities that serve children. At the first Teddy Bear toss, the Gamblers collected 400 stuffed Bears. The number grew to 17-hundred in year two. 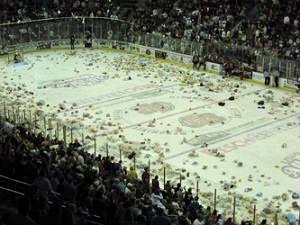 Last year, 7,500 fans tossed 7,988 Teddy Bears on the ice. It’s become such a popular event that the hockey game, with one of the top junior hockey programs in the country, is secondary. This years event is Saturday night, with the Gamblers playing host the US National Development program (Team USA). If you’re looking for something to put on your bucket list, this event may be it. Purchase a stuffed animal or two, bring them to the game and be a part of Teddy Bear pandemonium. In less than 30-seconds, nearly 8,000 bears will hit the ice. It’s heavier than any snowstorm you’ve ever seen. And I promise, the experience will give you chills. Over the years, the Gamblers have never been shutout and they don’t intend to start on Saturday night. Faceoff time is 7:05pm.